In October, 1831 , the parliament of the United Kingdom debated the Reform Bill and occasionally alluded to the threats of tax resistance being made by the various Political Unions that were pushing for the Bill’s passage. The system, we are told, works well… Whence, then, the phenomenon of Political Unions — of the people everywhere forming themselves into associations to put down a system which you say well serves their interests? 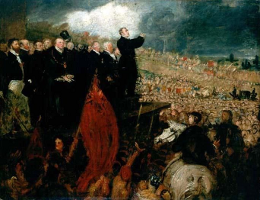 Whence the congregating of 150,000 men in one place, the whole adult male population of two or three counties, to speak the language of discontent, and refuse the payment of taxes? I am one who never have either used the language of intimidation, or will ever suffer it to be used towards me; but I also am one of those who regard those indications with unspeakable anxiety. With all respect for those assemblages, and for the honesty of the opinions they entertain, I feel myself bound to declare as an honest man, as a Minister of the Crown, as a Magistrate, nay, as standing by virtue of my office, at the head of the magistracy, that a resolution not to pay the King’s taxes is unlawful. When I contemplate the fact, I am assured that not above a few thousands of those nearest the Chairman could know for what it was they held up their hands. At the same time there is too much reason to think that, the rest would have acted as they did, had they heard all that past. My hope and trust is, that these men and their leaders will maturely re-consider the subject. There are no bounds to the application of such a power; the difficulty of counteracting it is extreme: and as it may be exerted on whatever question has the leading interest, and every question in succession is felt as of exclusive importance, the use of the power I am alluding to, really threatens to resolve all government, and even society itself, into its elements. I know the risk I run of giving offence by what I am saying. To me, accused of worshiping the democracy, here is indeed a tempting occasion, if in that charge there were the shadow of truth. Before the great idol, the Juggernaut, with his 150,000 priests, I might prostrate myself advantageously. But I am bound to do my duty, and speak the truth; of such an assembly I cannot approve; even its numbers obstruct discussion, and tend to put the peace in danger, — coupled with such a combination against payment of taxes, it is illegal; it is intolerable under any form of government; and as a sincere well-wisher to the people themselves, and devoted to the cause which brought them together, I feel solicitous, on every account, to bring such proceedings to an end. But there’s a nod and a wink there, since he sees these unruly mobs of commoners as the bad cop to his Reform Bill’s good cop: pass the Reform Bill, he tells his colleagues, and the mob will then have a legitimate outlet for their grievances within the political system and they won’t be tempted to resort to these threatening independent organizations. …There is in truth a great anomaly in the relation between the English people and their Government. Our institutions are either too popular or not popular enough. The people have not sufficient power in making the laws; but they have quite sufficient power to impede the execution of the laws once made. The Legislature is almost entirely aristocratical; the machinery by which the decrees of the Legislature are carried into effect, is almost entirely popular; and, therefore, we constantly see all the power which ought to execute the law, employed to counteract the law. Thus, for example, with a criminal code which carries its rigour to the length of atrocity, we have a criminal judicature which often carries its lenity to the length of perjury. Our law of libel is the most absurdly severe that ever existed — so absurdly severe that, if it were carried into full effect, it would be much more oppressive than a censorship. And yet, with this severe law of libel, we have a Press which practically is as free as the air. In 1819 the Ministers complained of the alarming increase of seditious and blasphemous publications. They proposed a law of great rigour to stop the growth of the evil; and they obtained their law. It was enacted, that the publisher of a seditious libel might, on a second conviction, be banished, and that if he should return from banishment, he might be transported. How often was this law put in force? Not once. Last year we repealed it; but it was already dead, or rather it was dead born. It was obsolete before le Roi le veut had been pronounced over it. For any effect which it produced it might as well have been in the Code Napoleon as in the English Statute-book. And why did the Government, having solicited and procured so sharp and weighty a weapon, straightway hang it up to rust? Was there less sedition, were there fewer libels, after the passing of the Act than before it? Sir, the very next year was the year 1820 — the year of the Bill of Pains and Penalties — the very year when the public mind was most excited — the very year when the public Press was most scurrilous. Why then did not the Ministers use their new law? Because they durst not; because they could not. They had obtained it with ease; for in obtaining it they had to deal with a subservient Parliament. They could not execute it; for in executing it they would have had to deal with a refractory people. These are instances of the difficulty of carrying the law into effect when the people are inclined to thwart their rulers. The great anomaly, or, to speak more properly, the great evil which I have described, would, I believe, be removed by the Reform Bill. That Bill would establish perfect harmony between the people and the Legislature. It would give a fair share in the making of laws to those without whose co-operation laws are mere waste paper. Under a reformed system we should not see, as we now often see, the nation repealing Acts of Parliament as fast as we and the Lords can pass them. As I believe that the Reform Bill would produce this blessed and salutary concord, so I fear that the rejection of the Reform Bill, if that rejection should be considered as final, will aggravate the evil which I have been describing to an unprecedented, to a terrible extent. To all the laws which might be passed for the collection of the revenue, or for the prevention of sedition, the people would oppose the same kind of resistance by means of which they have succeeded in mitigating — I might say in abrogating — the law of libel. There would be so many offenders, that the Government would scarcely know at whom to aim its blow. Every offender would have so many accomplices and protectors, that the blow would almost always miss the aim. The veto of the people — a veto not pronounced in set form, like that of the Roman Tribunes, but quite as effectual as that of the Roman Tribunes — for the purpose of impeding public measures, would meet the Government at every turn. The Administration would be unable to preserve order at home, or to uphold the national honour abroad: and at length men who are now moderate, who now think of revolution with horror, would begin to wish that the lingering agony of the State might be terminated by one fierce, sharp, decisive crisis. I often read contemporary radicals complaining that the government uses liberals and half-baked liberal reform as a way of defeating radical change. Here is a good example of a politician making that explicit. We read that in old times, when the villeins were driven to revolt by oppression, when the castles of the nobility were burned to the ground — when the warehouses of London were pillaged — when a hundred thousand insurgents appeared in arms on Blackheath — when a foul murder perpetrated in their presence had raised their passions to madness — when they were looking round for some captain to succeed and avenge him whom they had lost — just then, before Hob Miller, or Tom Carter, or Jack Straw, could place himself at their head, the King rode up to them and exclaimed, “I will be your leader” — and at once the infuriated multitude laid down their arms, submitted to his guidance — dispersed at his command. Herein let us imitate him. This is an allusion to the tax revolt led by Wat Tyler in 1379 . Tyler was assassinated while he was negotiating with the King, and his followers became furious. The King is then said to have boldly gone out to the crowd and told them that he was on their side and would be their leader and fight for their concerns, and on the spot he granted them a number of concessions and pardoned their leaders. While these topics of the non-payment of taxes were under discussion, the honorable and learned Attorney General was present: if the law was not what the honorable and learned Gentleman had compared it to — a rusty nail, he would set himself in motion. Was it true that this non-payment of taxes had been the subject of discussion?… He himself meant to assert that where there was a conspiracy to refuse the payment of taxes, there was a crime of a higher kind than some of the peace-making gentlemen opposite imagined.… [T]hese assemblies to rob the King of money voted by the Parliament were not a bit-by-bit question, almost amounting to a breach of the peace, as it had seemed to be considered in another place. Those men were no lawyers who, if non-payment of taxes was combined with circumstances of conspiracy, would not say, that it was an offence far advanced in the scale towards high treason. He could hardly have imagined there would have been so much said out of doors upon this subject, or he would have come armed with his authorities for this assertion. Did the House know the sort of publications that had been issued on this subject? He had had put into his hands a pamphlet, with a portrait of his noble and learned friend, the Lord Chancellor; it was a bad portrait — but it was a portrait prefixed to his speech on this question. It was right to publish his speech, and the cheaper the rate at which such speeches were circulated, and the more they were ventilated through the country, the better. He complained not that it had been so ventilated, but that a note had been appended to it in such a way, that unless looked at most carefully, it might be taken for part of the speech itself. The note was this — “God grant that all this may be right; but, depend on it, that the watchword will now be ‘pay no taxes.’” He repeated, that unless the sword of the Attorney General was, in fact, the rusty iron it had been compared to (though it had ever and anon been proved a sword sharp enough), these were publications that did require the attention of his honorable and learned friend. He would not say, that the Attorney General would neglect his duty in permitting these publications to go unreprehended and unnoticed; but he would go the length of stating to the Attorney General, that if the language used in that House, bold and unlimited as it might be, by the latitudinarian nature of their forms of debate, was thus permitted to be exceeded out of doors, the law was, indeed, a dead letter. It was quite true, that the British public were not to be governed by the sword — but they were by the laws; and one of those laws was, that the recommendation of peace-breaking, of tumult, of risings against the Government, of non-payment of taxes, was an offence which, by a slight limit alone, was out of the pale of treason. A number of other opponents of the Bill tweaked supporters for being too cozy with the Political Unions and for refusing to condemn their tax resistance resolutions strongly enough. At a meeting of his fellow-parishioners of Mary-le-bone (of which he was the Chairman) a resolution was come to, not to pay the taxes imposed by the Select Vestry, but to allow their goods to be distrained. He considered that his fellow-parishioners had acted legally, and their conduct had produced a most beneficial effect, for a disposition was already shown on the part of the Select Vestry to accommodate matters. [T]he parishioners of Marylebone had no intention of violating the law. The law directed, that in case of nonpayment of rates the goods of the party refusing were to be distrained. The inhabitants of Marylebone would refuse to pay the rates imposed by the Select Vestry, but they would submit to the alternative provided by the law, and allow their goods to be taken away. He thought that their resolution could not be considered in the light of a violation of the law. A man might refuse to pay the taxes, and allow his goods to be distrained; but that was not the question. The question was, whether it was lawful for 150,000 persons to conspire together to refuse the payment of taxes. But the matter did not stop there. Threats had been employed to prevent auctioneers from selling distrained goods; and an auctioneer in Bath had been obliged, in consequence of intimidation, to issue a handbill, in which he gave public notice, that he would not receive for sale any goods distrained for the non-payment of King’s Taxes. All of these quotes (except for the one about the outcome of the Wat Tyler tax rebellion) come from Hansard’s Parliamentary Debates , Third Series, Volume Ⅷ. They were all acquainted with a peaceful, orderly, and most respectable body of men called Quakers, to whose example he wished specially to call the attention of the meeting. This respectable sect of Christians refused to support a parson, but, in their opposition, they did not knock out the brains of the tithe-collector — they simply suffered a distress to be levied upon their goods. Now, if the Quakers refused to pay the tithes, the people generally might refuse to pay the taxes; and, if the bailiff came, he should like to know where they would find the auctioneer who would dare to sell, or the people who would dare to buy. The voice of the auctioneer, he conceived, would be passive, not active; and rather than knocking down, he would be himself knocked down. While upon this point, he could not but think of another glorious patriot, whose name and character, during a long night of despotism, shone bright as the day-star of British liberty, whose example ought to be as an encouraging beacon for their future guidance. When Hampden refused the payment of ship-money, his gallant conduct electrified all England, and pointed out the way by which the people, when unanimous and combined, might rid themselves of an odious and oppressive oligarchy. He declared before God, that, if all constitutional modes of obtaining the success of the reform measure failed, he should and would, be the first man to refuse the payment of taxes, except by a levy upon his goods [tremendous cheering, which lasted some minutes]. I now call upon all who hear me, and who are prepared to join me in this step, to hold up your hands [an immense forest of hands was immediately elevated, accompanied by vehement cheering]. I now call upon you who are not prepared to adopt this course, to hold up your hands and signify your dissent [not a single hand appearing, loud shouts and cheers were repeated]. Mark my words — failing all other more constitutional means. The rioters leaving the jail burning, and setting fire, on their way, to various toll-houses, next carried, without resistance, the Gloucester county prison, liberated its inmates, and then set it on fire — sending off a detachment to aid the conflagration of the Bridewell, one wing of which seemed otherwise likely to escape. They reached the Custom-house, an immense building, left utterly unprotected. Its whole extent was forthwith added to the burning mass.… [T]he Excise-office… shared, unprotected and unresisted, the fate of the Custom-house. The Political Unions became bolder and more organized, and a national Political Union formed. On November 22nd it (and “all such associations”) was banned. It (and they) ignored the ban. The undersigned inhabitants of Manchester and Salford, having been always taught that no taxes are legal which are not imposed by the consent of their representatives, and having seen it solemnly pronounced in repeated votes of the House of Commons, that the majority of that House, being nominees of borough proprietors, are not the representatives of the people, hereby declare that they will not purchase the goods of their townsmen not represented in Parliament which may be seized for the non-payment of taxes, imposed by any House of Commons as at present constituted. “Stopping the supplies,” which had never been dreamt of since the revolution of 1688 , was now, by the highest authority, promulgated, not merely as a theoretical possibility, but as an actual occurrence; and men, who had never before heard that combination of words, or who had never affixed any practical meaning to the expression if they had ever heard it, were surprised and delighted to be thus invested with a new and most formidable instrument of popular power: and accordingly, when, in April 1832 , the monarch showed some intention of having an opinion of his own, the fraudulent device of the year before was brought into actual operation, and “stop the supplies” was the watchword by which the revolutionary party endeavoured to collect and consolidate their opposition to the King and the Peerage. From this was deduced a corollary, also recommended by lordly authority, that not only ought parliament to stop the supplies, but that individuals were justified in refusing to pay the taxes imposed by law. These monstrous propositions have had no immediate effect, but we are much mistaken if they will not hereafter rank amongst the foremost mischiefs created by these madmen. The idea has, by being familiarised to the public mind, lost much of the alarm and terror which it ought to create; and the idea of stopping the supplies, first broached by the Lord High Chancellor, and the individual right of refusing to pay taxes, asserted first by the brother and mere creature of the Lord High Chancellor, and then by a more important person, the noble colleague and nearest friend of the Chancellor of the Exchequer, will, instead of being the ultima ratio populi, become the ordinary and common mode of expressing public dissent from the policy of the king and the government! We need not waste words in proving that such principles can lead to nothing but anarchy; not merely to the overthrow of the existing constitution and the monarchy — that we believe the Reform Bill has done — but to absolute and uncontrollable anarchy. It may not be generally known, that during the late crisis, one person, and that one of station and rank, was ready to set a patriotic example in resisting a Government opposed to the just rights of the people. When a tax-gatherer called on Lord Milton last week, he requested the tax-gatherer to call again, because he was not sure that circumstances might not arise which might make it necessary for him to resist payment. The Anti-Reformers will soon be taught by severe chastisement, that the only real force which can be brought to bear upon this vast question of national interest is in the people, and in them alone. If, under the direct injunctions of their constituents, the House of Commons stop the supplies, where stands the Tory Government? If the shrewd and resolute people of this country, combining for the execution of that scheme of passive resistance which in Ireland has baffled all the dexterity of the law, should refuse to pay taxes, where, we repeat, would be the conservative Government? The accounts from every quarter of England are awful. Birmingham refuses to pay taxes; Manchester refuses to pay taxes; Westminster and London, there is reason to believe, will not pay taxes until the Reform Bill is passed. But will this dry rot in the foundation of all Government — this famine of the State — be confined to the above three spots, however great and popular? No, unquestionably; for the sentiment is everywhere, the obligation to non-payment is felt throughout the kingdom, by a large majority of men of all ranks, as the most sacred of political duties.